I'm fulfilling my second request in as many days, and yet another I'm pleased to share for the first time. The Dentists haven't exactly made themselves scarce on these pages, having enjoyed entries for their 1991 LP Heads and How to Read Them, and the archival demos/rarities 10" ep, Naked. Though they predated the seminal Brit-indie compilation, C86, The Dentists were akin to many of their strummy, wit-smart contemporaries like the Bodines and Close Lobsters. By the time they got around to tracking Powdered Lobster Fiasco, the band streamlined their shtick, eschewing much of their clamorous, and occasional psych-enhanced tendencies which involved their earlier release, without relenting what was inherently unique to them. 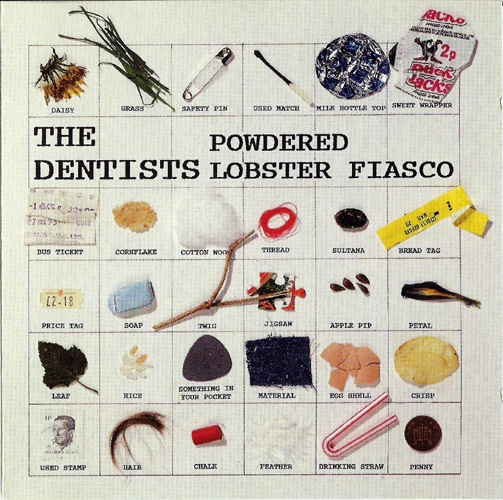 This album isn't on my Dentists "desert island" list so to speak, but conversely there isn't anything on PLF that I take exception with. Furthermore, this disc puts so much of '90s lamestream Britpop to utter shame, and that in itself is worth a bi-annual cleaning from the Dentists. Some fantastic songs on this album! Already have it, but it's well worth the download. Can't get enough of The Dentists. Thank you for sharing such great information. It has help me in finding out more detail about Dentists in chandigarh! any chance for a re reupload ? Things are gonna change in our favor.